Not just Soul... Northern Soul! 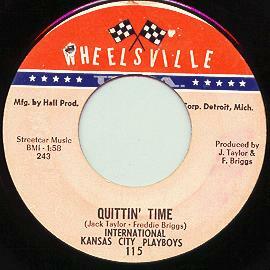 My name is Greg Tormo and collecting soul 45's from the 60's and 70's is what Solid Hit Soul is all about. Mostly of the northern variety, but I do delve into some ballads once in awhile. I have about 3,000 records now, ranging from common Motown hits like "My Girl" by the Temptations to more obscure like "A Dream" by a group from Chicago called the Creations which is on the Zodiac label. I buy, sell, and trade soul 45's. I don't make a profit doing this, but it does subsidize my habit somewhat...when I find spare copies of things I offer them to others who like the same sort of stuff. E-mail me at solidhit@hotmail.com if you're interested. Feel free to send me your wants list. I have a real job that pays the bills (rent, car, etc.) but in my spare time I like to track down writers, producers, label owners, singers, studio engineers, and anyone else I can find who was involved in the music industry during the 60's and 70's, and I interview them about the records they made. Some of their stories can be found on this web site. What is northern soul? Well, there are other sites on the web that have more detailed definitions (see my links page), but for now I'll just say it's a style of music that has been played mostly in clubs of northern England since the 1960's. It's the music of Black America: soul music with a certain danceable beat, most commonly heard on the records that Motown made during it's golden era in the mid 1960's. There were thousands of other entrepreneurs trying to capitalize on the sound that Berry Gordy made famous with his Motown label. All over the US, there were tiny record labels all attempting to get a sizable hit on their own artists in the style of the Four Tops or the Temptations. It is these less successful music makers that hold my interest and this site is dedicated to all those who wanted to score a big hit with their little records, but, for whatever reason, failed.